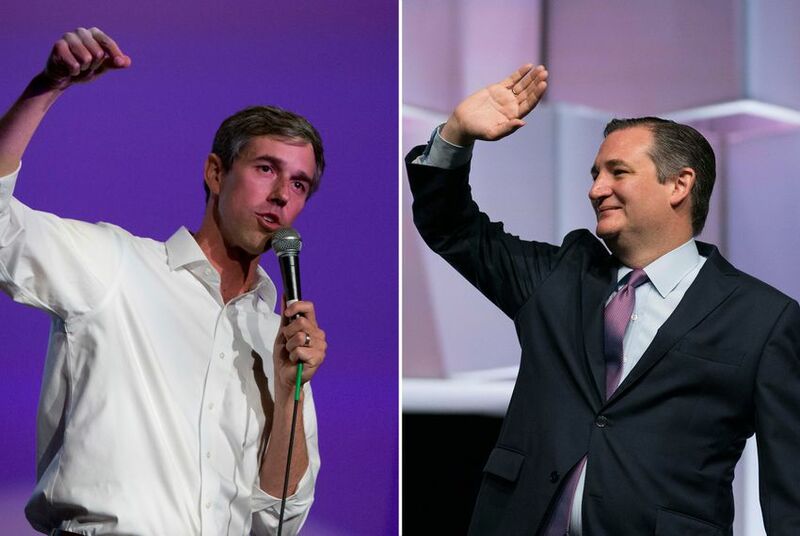 Beto O’Rourke leads Ted Cruz by 2 points in one poll. Oh, but in another one Cruz leads O’Rourke by 9 points. Who do you believe? Who do you want to believe? Me? I’ll go with the first one, because that’s what I want to happen on Election Day. I want O’Rourke, the Democrat who’s challenging the Republican Cruz for the U.S. Senate seat that Cruz now occupies. The Ipsos poll done for Reuters puts O’Rourke ahead by a margin that makes the race a dead heat. It was an online poll of “likely voters.” The Quinnipiac poll was done over the phone; it shows Cruz with a fairly comfortable margin as the campaign heads toward its conclusion. I know this much — which, admittedly isn’t all that much: O’Rourke making this race such a tight contest is news in and of itself. Cruz represents Texas in the U.S. Senate. Texas is one of the most Republican states in America. He isn’t exactly a warm-and-fuzzy kind of guy. Cruz is a darling of the TEA Party wing of the GOP, the one that opposed Barack Obama’s presidential agenda every step of the way. He once led a phony filibuster in an effort to repeal the Affordable Care Act. The idea that O’Rourke would make this a close contest boggles the mind of a lot of observers. I believe O’Rourke still has a steep hill to climb if he hopes to knock Cruz off his Senate seat. The state still loves its Republican officeholders. No … matter … what! However, just as Donald Trump proved every political “expert” wrong by being elected president in 2016, there remains a good bit of hope that Beto O’Rourke can upset the political gods yet again in Texas. That’s my hope anyway. Presidents of the United States of America usually don’t say things such as what came out of Donald J. Trump’s mouth today. He said he prefers a diplomatic solution to North Korean dictator/madman Kim Jong Un’s desire to become a nuclear power. Good. So does the rest of the civilized world. What is the president trying to do? Is he trying to goad Kim Jong Un into doing something extremely foolish? Is he trying to provoke the dictator to send missiles into South Korea, where roughly 30,000 American troops are stationed as part of a defense garrison? Presidents must be required to be circumspect. They must not be seen as provoking enemy states to act with extreme violence. Donald J. Trump doesn’t understand any of it. He has made a dangerous, reckless statement. I am now going to hold my breath. The U.S. Constitution grants the president the power to negotiate treaties with foreign leaders. It says nothing about members of Congress being a party to those negotiations, but does give the Senate the authority to ratify treaties. What, then, are 47 Republican U.S. senators doing by sending a letter to Iranian officials telling them that whatever treaty they agree to with President Obama might not be good after the president leaves office in January 2017? Are they injecting themselves into a negotiation that seeks to end Iran’s nuclear program? Are they interfering where they don’t belong? It looks like it to me. Reuters reported: “The letter, signed by 47 U.S. senators, says Congress plays a role in ratifying international agreements and points out that Obama will leave office in January 2017, while many in Congress will remain in Washington long after that. “‘We will consider any agreement regarding your nuclear-weapons program that is not approved by the Congress as nothing more than an executive agreement between President Obama and Ayatollah Khamenei,’ the letter read. My initial question is this: Do these senators think the Iranians are unaware of how treaties get ratified in this country? I think I’ll answer that one: If they do believe such a thing, they’re not as smart as they think they are. Another issue looms, though. It is this notion that members of one party comprising the U.S. Senate can actually influence the course of a sensitive negotiation that is taking place between the executive branch of the U.S. government and the leaders of a foreign nation — and a hostile one at that.